Every table game has its own layout. The roulette table layout is different from others, as it is designed for gambling and betting. As we know, there are three types of the roulette game: American, European and French. 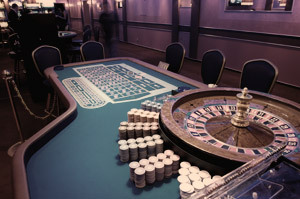 Each type of the game has some unique features, and they are shown on the roulette table layout. American and European roulette are almost the same. The only difference is zero. The European one has only one zero, while the American one has two zeros, which doubles the house edge and decreases the possibility to win of the players. The French roulette. You will understand it is French, as everything is written in French. The chips, which are used in the game, are of the same color, no individual color as in other types of the roulette game. Also the dealers has such practice in European and French roulette to use the rake to collect the lost chips from the table, while in the American version, the dealers do everything with their hands. The names of the roulette layout can differ; it depends on which part of the world you are. In the United States they call the French and European roulette European. While, very often in Europe you can hear, as somebody calls the European (single zero) roulette the American one. It is done so in order to distinct two single-zero roulettes but with different rules and roulette layouts. Layout of the American style consists of 38 numbers (1-36 numbers and 0 and 00). Two zeros give the house a so called house edge, which brings the casino 5.26 percent of every bet. It means that in every $100, which was wagered, the casino will take $5.26 in any case, either you won or not. You might have noticed that if you are winning in the straight bet, your actual winning is 35 to 1, instead of 36 to 1. So, there is no need to worry about the casino's survival. Layout of the European style consists of 37 numbers (1-36 numbers and 0). In this case the house edge is 2.7 pct. The winning is paid the same on the straight bet - 35 to 1. Also the gamblers should be attentive, as the color of the chips is the same. French roulette is more gambler-friendly. Let us assume that you betted on red, but the zero came up. What should you do? In American roulette you would lose everything, but here you can either take a half of your bet back, or leave the whole bet on the table in order it will play the next time.